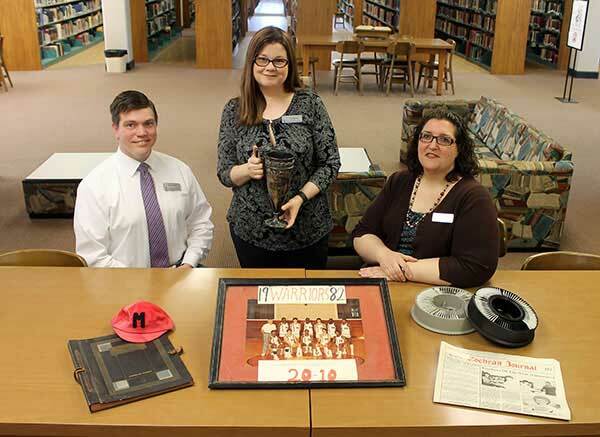 L-R are members of the MGA Library archival team, Ben Mullis, April Warren, and Ann Williams, along with a few of the items they will be working to preserve, catalog, and, in some cases, display. Thanks to two recent grants, Middle Georgia State University librarians on the Cochran Campus are taking important steps to preserve local history. A $1,700 grant from the Georgia Historical Records Advisory Council is allowing the library’s archival team to transfer nearly three decades’ worth of back issues of the Cochran Journal newspaper from hard copies to microfilm. A second grant of $1,005, also from the council, will allow the archival team to organize and preserve thousands of Cochran Campus images – old photos and slides, along with other items - collected over many years. What is now the Cochran Campus of Middle Georgia State University (MGA) was founded in 1884. From 1929 until 2013 the Cochran Campus was known as Middle Georgia College. MGA was created through the consolidation of Middle Georgia College and Macon State College. Besides Warren, members of the archival team are Ann Williams, assistant director for library services, and Ben Mullis, reference and instruction librarian. Warren said Roberts Library already owns the Cochran Journal, founded in 1908, on microfilm covering the years 1910 to 1991 but has a backlog of print copies dating to the early 1990s that needs to be preserved. Besides hard copy photos, slides, and negatives, the archives of the former Middle Georgia College contain student newspapers, yearbooks, photos, old trophies, caps, clothing, and more. Much of the memorabilia is related to the school’s previous mascots, Warrior and Wolverine. Among the most unique items is a taxidermy mount of a real wolverine. Most of the archival material is housed on the third floor of Roberts Library. “Preserving these items is important to our alumni for when they visit the Cochran Campus,” Warren said. The preservation work funded by the grants is expected to take about a year. For more information, contact Warren at april.renfroewarren@mga.edu or 478.934.3071.